The scope of occupational health nursing practice has expanded and taken on a variety of roles, giving rise to opportunities for nurses to care for workers in various workplace settings. 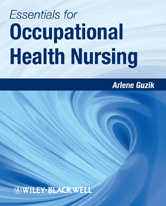 Essentials for Occupational Health Nursing provides a highly practical and accessible guide for nurses entering or already engaged in this important field. The text begins with the foundations for occupational health practice, covering the domain of occupational health and the role of the many professionals within the specialty. Subsequent chapters address program development, professional development, workplace regulatory requirements, workplace injury management and managing health and productivity. Case studies pertaining to fitness for duty and medical monitoring provide real-life scenarios to aid in learning.